When Katara and Sokka return home to the Southern Water Tribe, they are shocked to find that it has gone from a small village to a bustling city! Malina, a Northerner, is behind the change and plans to unify the two groups, but Gilak, a Southerner, leads a fierce rebellion to stop her. In the face of these two opposing tribes, Katara will have to make peace with her nostalgia and distrust to save the home she loves from being permanently torn apart. 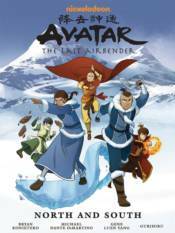 This special, oversized edition of Avatar: The Last Airbender-North and South features volumes 1-3 with annotations by writer Gene Luen Yang and artists Gurihiru, as well as a sketchbook section with new, behind-the-scenes material!